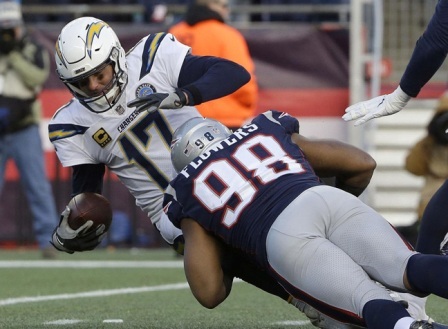 Philip Rivers wanted it badly, a win against Bill Belichick and Tom Brady to extend their respected Super Bowl chances. Unfortunately, it didn’t happen for the 15-year veteran signal caller for the Los Angeles Chargers. 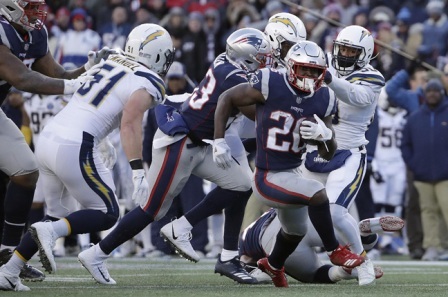 Brady threw for 344 yards and a touchdown and Sony Michel ran for 129 yards and had three touchdowns in the New England Patriots triumph 41-28 victory over the Chargers in Sunday’s AFC Divisional Round game at Gillette Stadium. In the win, New England earned their eighth straight trip to the AFC championship game and will travel to Kansas City next Sunday to play the top-seeded Chiefs. Although Rivers played well and finished 25-of-51 for 331 yards, three touchdowns and an interception, Los Angeles was doomed after a horrid first half. The Patriots scored on their first four possessions of the game and held a 35-7 lead at halftime. Michel led the charge early and scored from 1-yard on the opening drive of the game to cap a seven minute,14-play offensive flourish. Allen and the Chargers responded with a 43-yard score on the next possession to tie the game at 7-7. That would be as close as Los Angeles would get. Michel added a 14-yard score, followed by a 15-yard touchdown from Brady to Phillip Dorsett with 12:17 remaining in the second quarter. Six minutes later, Rex Burkhead ran in a six-yard score, capped off by another five-yard touchdown for Michel to complete the 28-0 avalanche of unanswered points. Gordon finished with only 26 all-purpose yards and a touchdown, while Allen had two receptions for 75 yards and a touchdown. Los Angeles ultimately fell two games short of clinching a trip Mercedes-Benz Stadium for Super Bowl LIII. Brady will look to beat Chiefs, MVP favorite Patrick Mahomes, for a chance to be one step closer to earning Super Bowl ring number six. Kick-off between the New England Patriots and Kansas City Chiefs is Sunday Jan. 20, at 3:40 p.m.